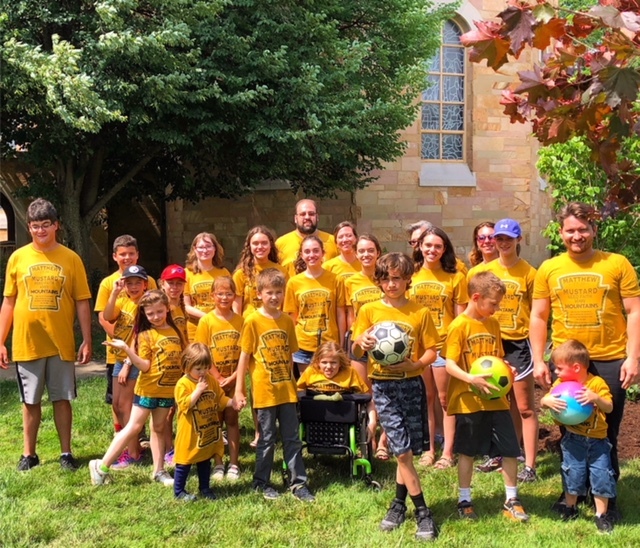 The youth of the Saint Elijah Serbian Orthodox Church School Congregation in Aliquippa, again this year had the opportunity to expand their knowledge in faith and culture by attending the St Elijah Day Camp. The camp has a long-standing tradition of brining together children of all ages for the 41st year in a row. The Camp started with 18 happy campers who were eager to learn more about their faith and strengthen relationships with one another. The inspiration for this year’s Day Camp is taken from the Gospel of Matthew 17:20 - "If you have faith as small as a mustard seed, you can say to this mountain, Move from here to there, and it will move. Nothing will be impossible to you" hence the theme for this year was the following: Mustard Seed Faith - Moves Mountains. Every day started with a prayer in church followed by a lesson of the day. Fr Branislav was happy to see how children were attentive and interested in the lectures, especially when they were engaged in crafts, games, and other educational activities. After the religious class, students had the opportunity to learn traditional Serbian singing. A very energetic and talented Protinica Danijela Barac led the music classes this year and everyone enjoyed working with her. She thought her students two songs in Serbian, one being "Vera Nasa" (Our Faith) and the other "Govori Gospode" (Speak to me, O Lord). Children also took a field trip to the "Living Treasures" Zoo in New Castle, PA where they spent an afternoon feeding animals, playing and enjoying being in nature. Although there was no need to escape the heat, another afternoon was spent at the pool where everyone enjoyed each-others company. During the camp-days, various individuals were helping in different ways. The Mother's Club was in charge of food but there were many others who helped for a couple of hours at a time. We thank all those who took time out of their busy schedules and invested it in the future of our Parish. It truly is a blessing to see how, not only parents but grandparents, kumovi, family, and friends come together to support and cherish what we value the most, our children being raised in our faith and tradition. At the end of this year's Day Camp, a picnic was held which was attended by past and present campers and staff. Cherishing the memory of the founder of St Elijah Camp, +Very Rev Stavrophore Stevan Stepanov, campers along with their parents and staff, planted a garden in his memory. St Elijah Community would like to thank all who in any way supported and made this year's Day Camp a success. Smiles on the faces of our campers is the best reward that one can receive!